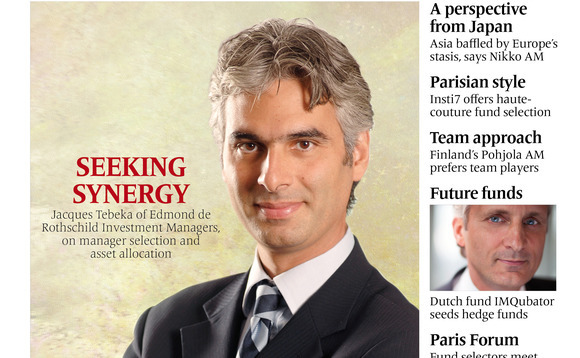 Jacques Tebeka is head of diversified multi-management at the newly formed Edmond de Rothschild Investment Managers. He talks to InvestmentEurope about manager selection and client needs in a troubling investment climate. Manager selection involves a three-step fundamental analysis process. The first stage is to consider how managers are positioned in the current economic cycle. This includes examining monetary policy and asking whether Europe or elsewhere is experiencing expansion or recession. “We don’t look at the Belgian economy every day,” Tebeka explains. Instead, his team develops a more general view on how European and global economies are shifting, taking into account GDPs, industrial production and inflation figures. Although individual countries are not looked at in detail on a daily basis, some economies warrant greater levels of attention, namely Japan, the US and China, Tebeka says. The second step is examining market valuations. This allows Tebeka to come up with asset class criteria for the medium to long-term indicating how allocations will be split between currencies, bonds and equities. Here economic changes to purchasing power parity (PPP) or real interest rates influence Tebeka’s decision-making process. The final step is more short-term and involves analysing investor psychology. Tebeka looks at opinion polls and research to gauge whether investors are more bullish or bearish, assess their risk tolerance and decide how markets are behaving. This is more science than art, he says, noting that “there is nothing philosophical about it”. Understanding temperament helps mould the final asset class allocations in the three diversified portfolios. The selection process begins by running a quantitative filter over the investment universe of roughly 7,400 longonly Ucits III funds. Each fund receives a grade which determines its trajectory – whether it will prove resilient in market downturns or not. Tebeka looks for regularity in the fund’s performance and in its risk profile. He says performance losses are tolerable as long as they aren’t too severe. Once the quantitative filter has narrowed down the investment universe to approximately 400 funds, Tebeka and his colleagues go about meeting the management teams of the funds that have demonstrated stable performance over reasonable lengths of time.